I love seafood. 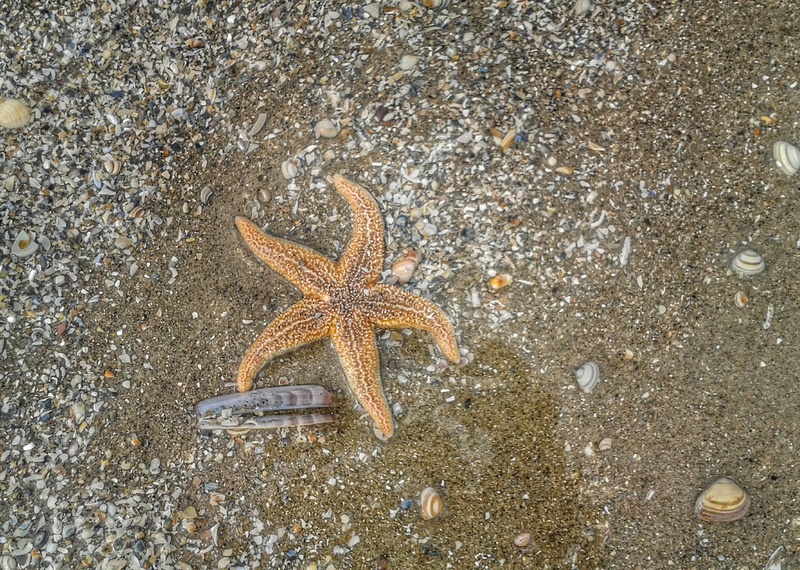 It has a delicious taste, a gorgeous smell and sometimes it is just lying there, on our beach! Whenever I go on holiday I try to taste new seafood – I am happy to say that so far I tasted shrimps, squid, shells and all kinds of fish. However, not all seafood is good. Like this. I tasted it once and it was absolutely horrible. Maybe this was because the thing had been dead for some time, but anyway I decided to move it from my bucket list. Only labradors eat horrible stuff like this. I really like the taste of squid, but I prefer crabs above all things from the sea. Not the big ones, they are too crunchy. I like the little ones, they are young and tender. There is nothing like it! What is your favorite seafood? 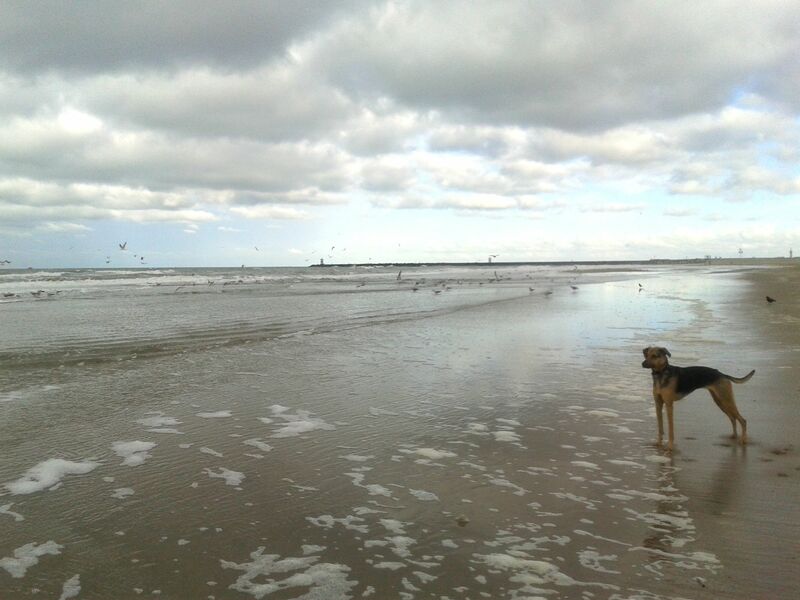 We went to the beach, hurray! It was storming the last few days, so we only walked in the forest. 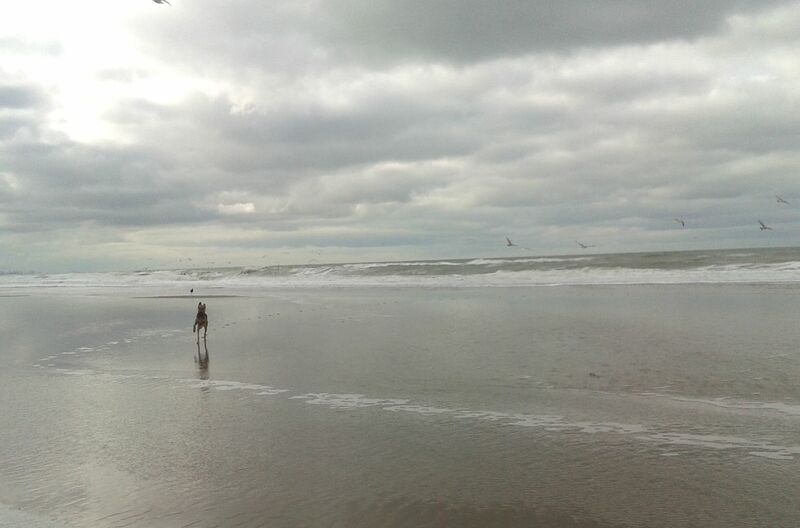 But today the weather was fair, so we walked through the forest and the dunes to the beach. It smelled promising when we got there: I smelled lots of salty juicy sea food. There were a lot of birds too, eating things. That is always a good sign. I usually chase them away and check out what’s available for snacking. I don’t know what they are, but they are not good for eating. They smell tricky. There was a labrador eating them, but you should never trust a lab when it comes to eating. They eat everything, including non edible stuff. I met a lab once who told me he had eaten six raw eggs, including their carton box. Of course, afterwards he concluded this was a bad idea, it was kind of hard to digest. He also was abandoned from the bedroom that night, because he farted all night long. Ha! Lab’s are okay, they are harmless and always willing to play. But why are they so empty-headed? I must admit I was very lazy this week. I felt a bit moody and not like doing anything. Of course I had to go out with M or P, they need their exercise. They even go out when it is raining – I don’t know why. I told them time and again we can stay indoors when it is pouring, like it did a lot this week, but they do not seem to understand. Maybe they like walking in the rain. When she has this with her, her arms get tremendously strong and she throws the ball very very far! I like that. 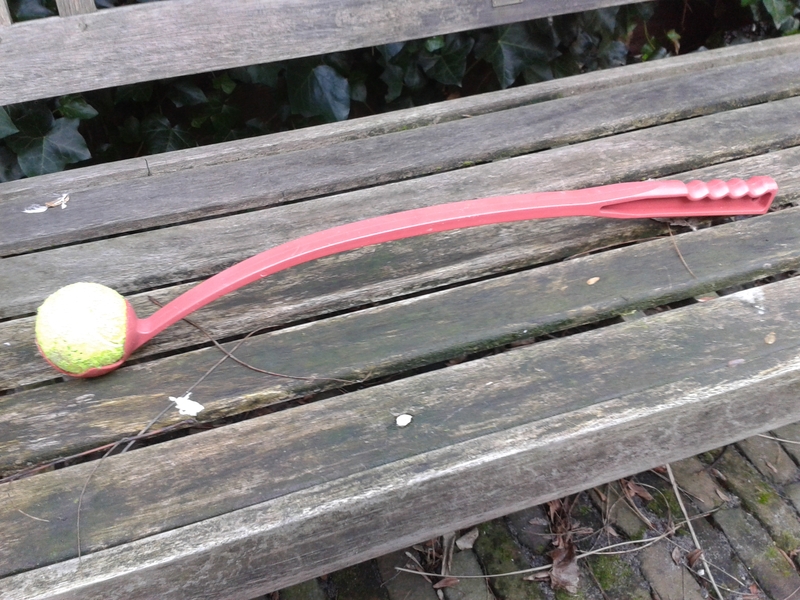 I wait for her to throw it and then I run like hell, looking up to the sky where the ball is going. Usually I catch it before it hits the ground. 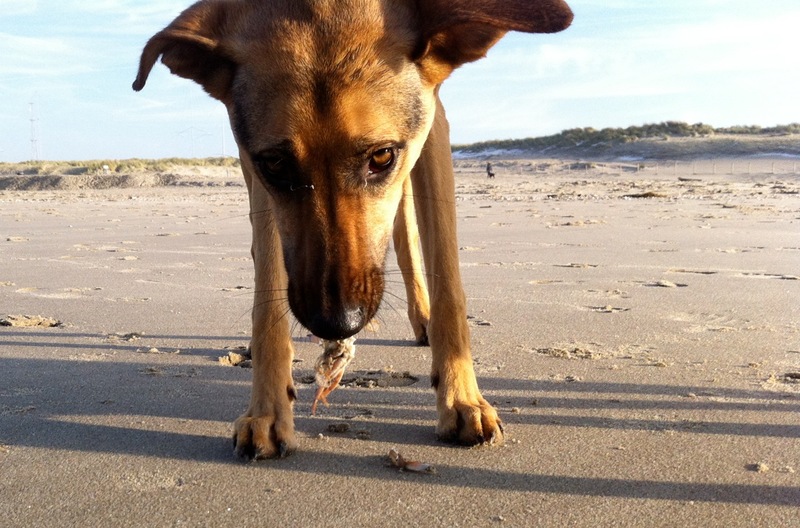 When I am doing this, I do not want to play or sniff the sand, I even run past little crabs (although I remember where they are, so I can eat them along the way when I run back to M). So I had a good time on the beach. Besides from fetching the ball I met a friend, his name is Luca. I like playing with him, although sometimes he is a bit pushy. In that case I show my teeth and he backs off. I also met Lana, a former stray dog from Spain. We always measure forces when we meet. Today we found out we are both still strong. After this I ran some more. Now we are home again. I will rest in the sun and enjoy the feeling that my laziness left me. 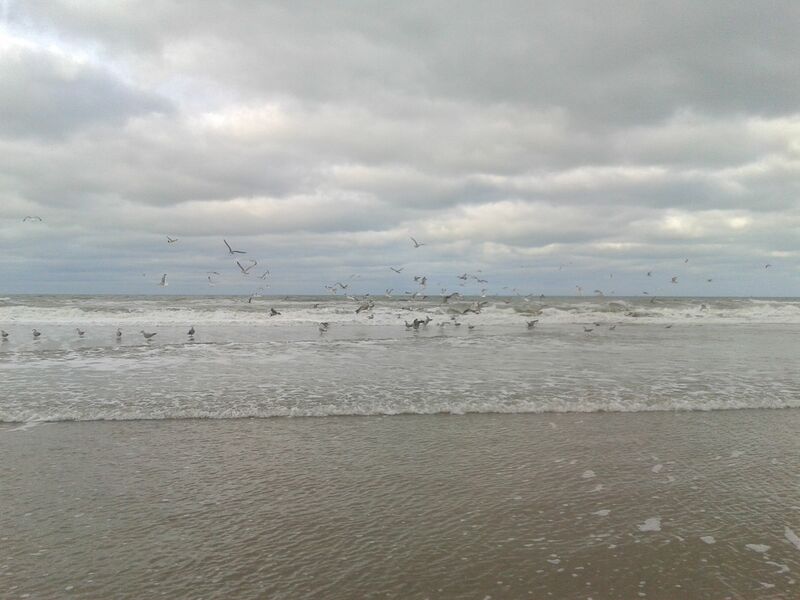 Big seagulls, loads of them! I wanted to chase them, but I had to run through the water to get to them and the water is very cold. So I stood still, trying to resist the urge to go to them. But then I thought: if I run very fast and jump over the deepest pools, maybe I will not get too wet and cold. So I went for it! 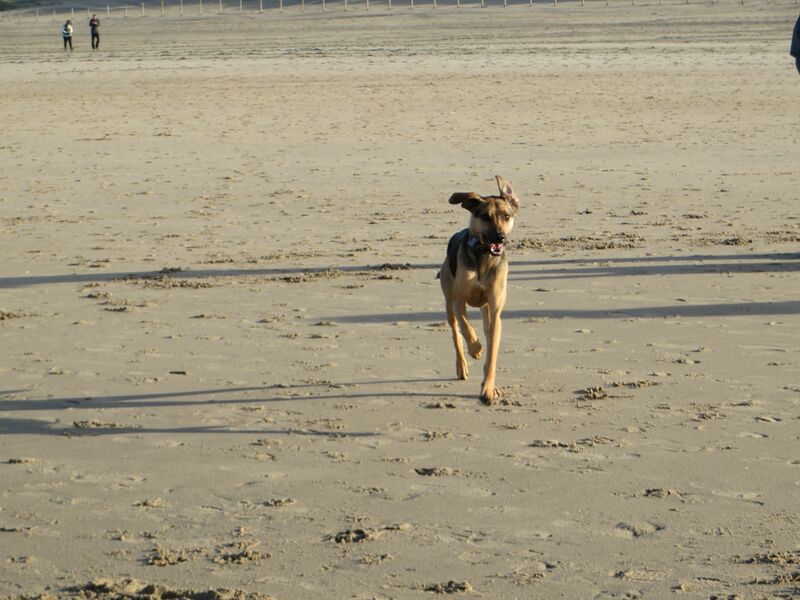 I accelerated (did I tell you I am the fastest dog on the beach?) and ran like lightning towards the big juicy birds. Of course they all flew away, that is what they always do. That is okay, chasing them is great fun. I love the way they hover above me, I love the spaciousness of the beach. It all makes me very happy. In the end, I wasn’t too cold. As long as I run, I stay warm. I have given it a lot of thought and I have come to a conclusion: I know what my favorite pizza is. I thought especially about this topic during meditation. 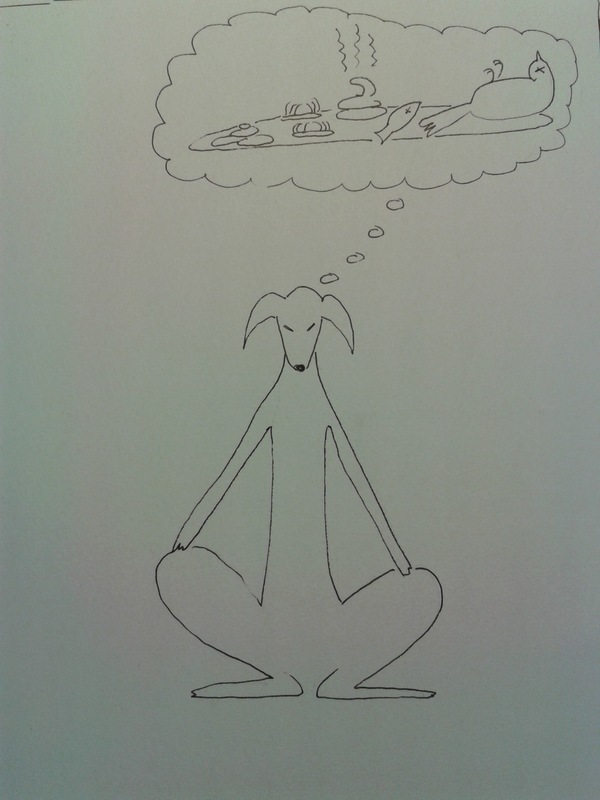 I know I should let go of all my thoughts while meditating, but that is very hard with musings about pizza. So I decided I’d think it through once and for all and after I made up my mind about my favorite topping, I could stop thinking about it during meditation. And be ready to ’empty my mind’, whatever that is. I am ready to reveal it now: my favorite pizza is a quattro stagioni. That means it consists of four toppings. One topping is a big fat juicy pigeon (dead, so it won’t fly away). The other one is fruit de mer, especially little crabs and some herring. 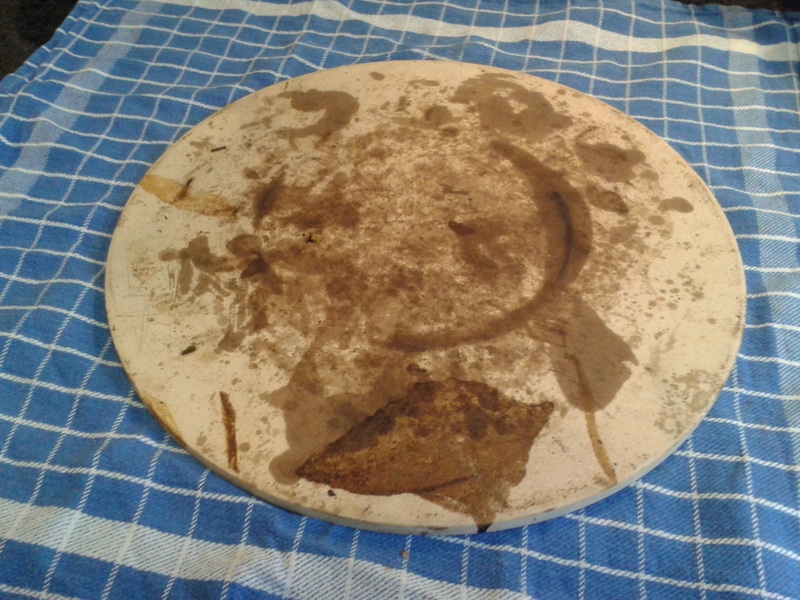 The third topping is another real delicacy: cat poo (preferably fresh, but a few days old is no problem). The fourth piece of my favorite pizza is an even more craved for delicacy, very hard to find (which puzzles me, because there should be loads of it, considering the number of people): human poo. When I told M about my favorite pizza topping, she made a face that probably means she will not make this one for me. She did tell me that I am presumably right in choosing these toppings, from a canine point of view. And that I could make some money if I would sell this pizza to all the dogs I know. Ha! She must be joking. Selling pizza, what a silly idea. I would never do that, I would eat them all! Besides the crabs there was other sea food, too: all kinds of shells and little stars. But they don’t taste as well as crabs, so I leave them to the seagulls. 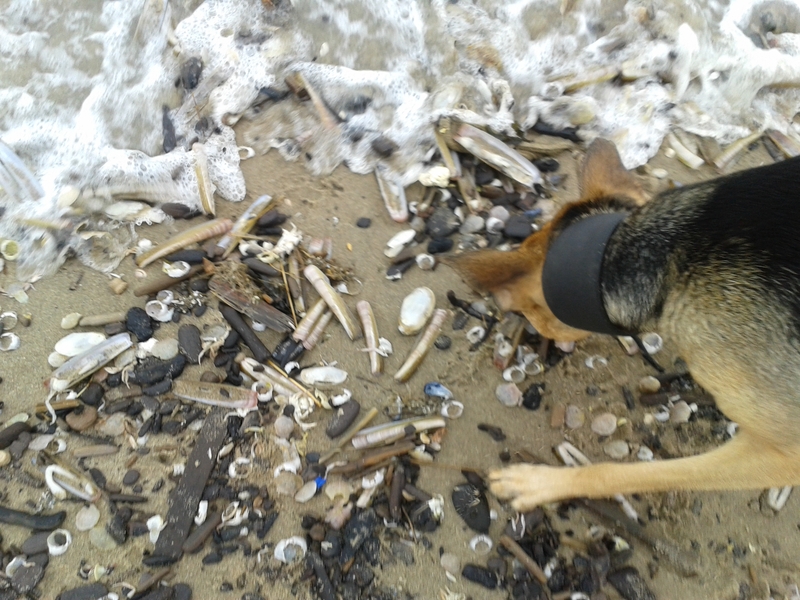 Once I met a dog who ate a whole jellyfish and got very sick because of it. Eat a jellyfish!!! He was not a very bright dog, that one. Humans like to make lists, I notice as I am browsing the internet. They name their five favorite travel destinations, or the ten things you should do if you want to date a pretty girl. Some of these lists are very awkward. The one about dating, for instance. The most important thing is not in the list: give her yummy food! Humans can really miss the point, sometimes. This is my number one, although I must admit I never really tasted a pigeon. I did manage to catch one, lately, but I ended up with a lot of feathers in my mouth and no juicy meat, because the pigeon escaped. So maybe this is not a good number one for this list of favorite things. Maybe I should make a list of favorites I wish for, another time. This was a pizza with mozzarella and bacon, by the way. Delicious! Duck tastes really good, especially the ducks in France. The meat is juicy, with a good bite and wonderful taste. I hope we will visit France again, soon! I love little crabs. 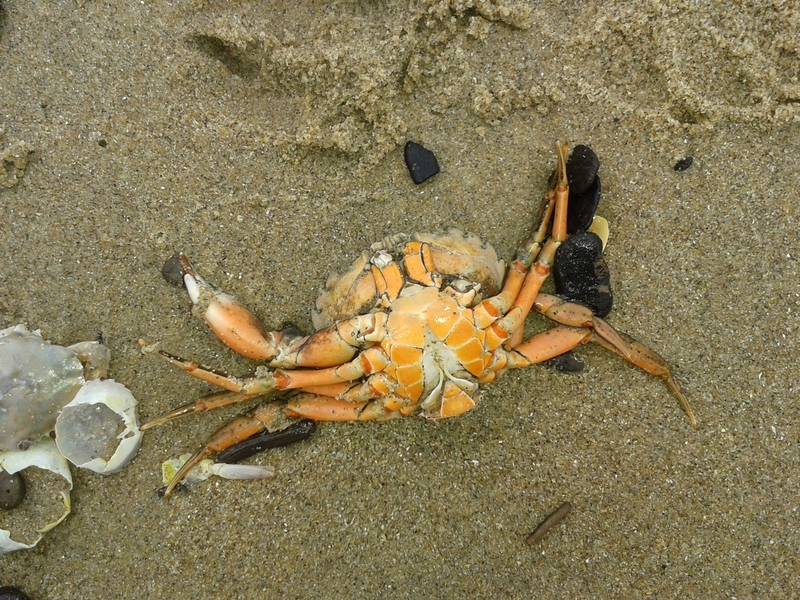 When I am lucky, I find them on the beach near our house. I search for them, they usually hide between the shells and seaweed on the shore. But I always find them, of course. I like them best when they are really fresh, just out of the water. Sometimes they try to run from me, but that is stupid. I am the fastest on the beach, so resistance is futile! 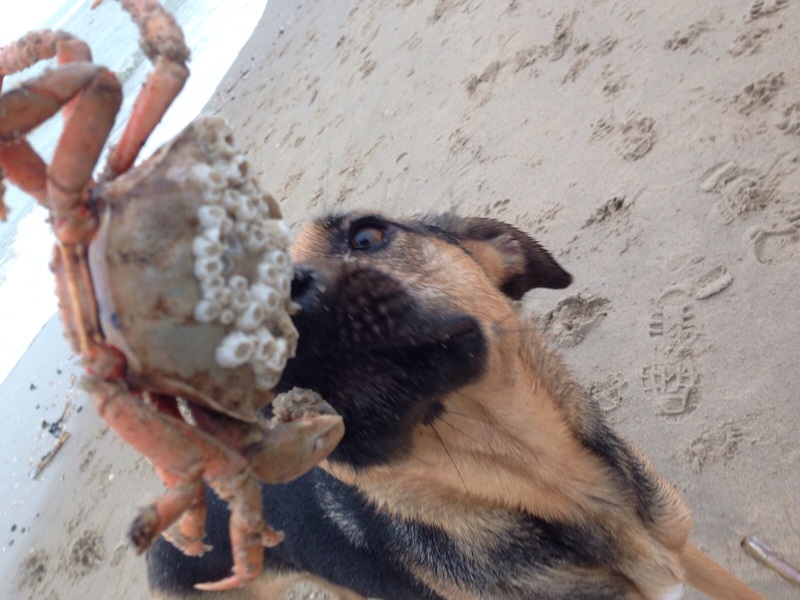 One time I tried a larger crab, but that did not taste as well as the little ones. A bit too crunchy, in my opinion.